Even before George Herbert Walker Bush’s cadaver was cold last Nov. 30, as accolades came heaping upon the one-term president (1989-1993), I wondered who were they talking about? The dictum “Do not speak ill of the dead,” attributed to the 6th century BCE philosopher Chilon of Sparta, may be appropriate at your uncle’s funeral. But public figures are different. If this one-sided idolatry was true of the recently departed Sen. John McCain, it’s even more so regarding former Pres. Bush Sr. The tributes were so over-the-top you’d think a burning bush, not George Bush, was being worshiped. Those who would admonish critics to hold their tongues and refrain from voicing a counter-narrative until after the propagandistic pageantry had unfolded remind me of those NRA shills who chide gun control advocates from speaking out while victims of the latest mass shooting outrage are being mourned. Of course, what these minders are really saying is: “Wait until the media limelight and public awareness are no longer focused on this issue/politician so that when you do finally speak out, few if anybody will still be interested.” Given the attention span of what Gore Vidal dubbed “the United States of Amnesia,” this admonition guarantees that dissenting points of view go straight down the memory hole. There was nary if any mention of Bush Sr.’s reign at the CIA (when anti-Pinochet Chilean diplomat Orlando Letelier was car bombed in Washington) and H.W.’s involvement in: The Iran-Contra scandal and his subsequent pardons; demagogic Willy Horton and “revolving door” furlough campaign ads; the Panama invasion; April Gillespie and the Iraq invasion; his father’s alleged dealings with the Nazis; his son Neil’s role in the S&L scandal; George W.’s alleged evasion of Vietnam, ad infinitum. Amidst all the presidential pomp, on Dec. 5 the casket was lifted off the black-shrouded bier that had carried Abraham Lincoln and driven from the U.S. Capitol to the Washington National Cathedral. But as far as I’m concerned George H.W. Bush went merely from lying for the state to lying in state. Since June 30, 1985, I’ve always wondered what, if anything, was the then-vice president’s role in the assassination of Haruo Remeliik, president of Palau, located in Micronesia? I lived in this Western Pacific island nation from 1984-86 and was an eyewitness, reporting for international and regional news agencies. I never suspected then-Pres. Ronald Reagan, who fought World War II in Culver City, was directly implicated in rubbing Remeliik out. But as the only foreign full-time newsman then residing in Palau, as an objective observer I was struck by a singular salient fact: Regarding Palau’s presidents’ murders, going back to 1944, all roads led to George H.W. Bush. From Sept. to Nov. 1944, the Battle of Peleliu raged in southern Palau, one of the bloodiest conflicts during WWII’s island-hopping campaign, costing the Marines and Navy 6,526 casualties. As a very young man, Navy pilot Bush had impressed upon him the strategic importance and value of this island chain that stretches across vital Australia/Japan/Indonesia shipping lanes in the southwestern Pacific. Bush’s mysterious connections to Palau would continue while he was CIA Director, Vice President, and President. After the U.S. conquered Palau, Washington administered the far-flung archipelago as part of the United Nations Trust Territory of the Pacific Islands from 1947 to the 1990s. Following WWII, America agreed to a sacred trust: to develop Micronesia so it could eventually exercise a legitimate act of self-determination via plebiscite, with voters freely deciding the islands’ future political status. However, Washington recognized the military value of this three million-square-mile area stretching between Hawaii and the Philippines (with Palau as its southwestern tier), and it became the sole Strategic Trust of the 11 UN trusteeships. After the U.S. A-bombed Hiroshima and Nagasaki in 1945, the Defense Department used the Marshall Islands as a nuclear test site from 1946-58. In the 1970s, as Palau prepared for self-rule, concerned about nuclear arms, fallout and irradiation, a supermajority of Palauans passed a nuclear-free constitution. 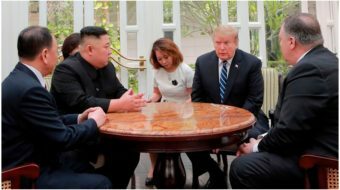 However, this clashed with Pentagon policy to neither confirm nor deny that its crafts are nuclear powered or armed, plus DOD plans to relocate U.S. forward bases from the Philippines to Micronesia. The conflict came to a head while Bush Sr., veteran of WWII’s Palau campaign, was CIA director and in the Executive Branch. Zeder had been admitted to the Young Presidents’ Organization in 1960 at the University of Michigan, where his roommate was Prescott S. Bush Jr., G.H.W. Bush’s brother. While chairman and CEO of the diversified manufacturing company Hydrometals Corporation, Zeder moved the firm from New York to Dallas in the early 1960s. Zeder was elected to the City Council in Dallas in 1971 and also served on the Dallas-Fort Worth Regional Airport Board. 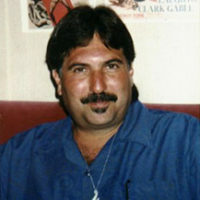 His business interest in the Pacific Islands is evinced by the fact that he was chairman of the board of Paradise Cruise Corporation in Hawaii from 1978 to his death in 2004. Zeder played a key role in bankrupting tiny Palau by supporting IPSECO, an apparent covert action in the guise of a power plant, with generators and a fuel farm far too big for Palau’s tiny population, but large enough to provide power and fuel for future possible U.S. military bases. The only way the emerging nation could pay off its enormous energy-related debt was by approving a treaty called the Compact of Free Association. The accord would nullify Palau’s anti-nuclear constitution, in exchange for U.S. aid. Much was made about “regime change” in Iraq because of Saddam’s purported WMDs by Pres. 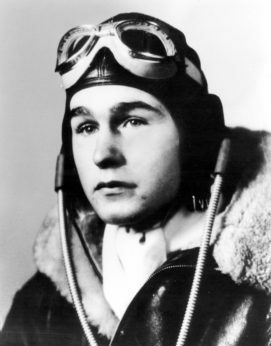 Bush 43. But scant attention has been paid to the tragic tale of regime change in a Pacific Island of 15,000 indigenous people who dared oppose U.S. nukes, nor to Bush 41’s connection to Palau. George W. Bush may have ballyhooed “spreading democracy,” but while Bush Sr. was in the Executive Branch, Palauans were compelled to vote about 15 times in around as many years on self-rule and their nuclear free status. Palauans could vote, but their vote didn’t count unless it favored U.S. policy. Palauans had to keep casting their ballots until Washington attained its desired result: Rescinding the Palau constitution’s anti-nuclear clauses. It was a unique form of voter suppression. During this display democracy, Palau was gripped by a reign of terror. 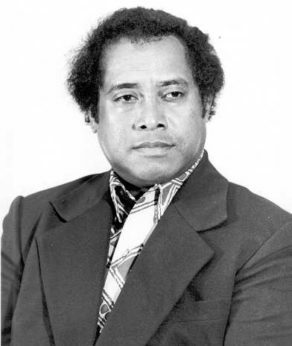 On June 30, 1985, President Haruo Remeliik was assassinated, which reopened the then deadlocked treaty negotiations. Shortly after the liquidation, then-Vice Pres. 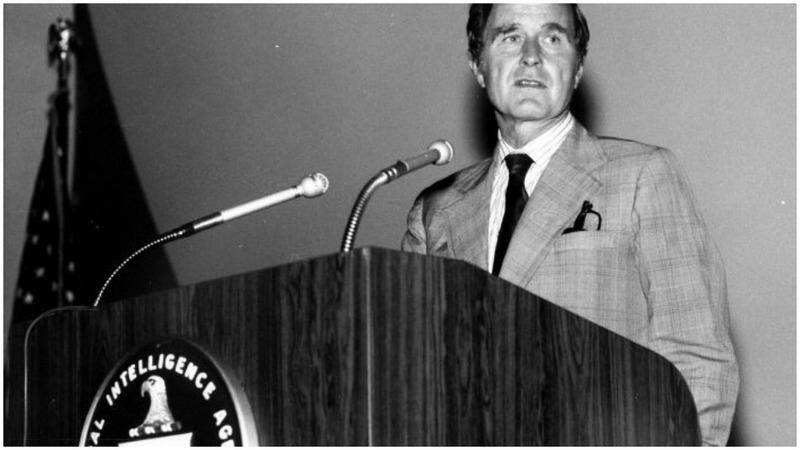 Bush personally flew to Saipan in the Northern Marianas, located north of Palau and where the Trust Territory administration was headquartered, to reopen stalled status parleys, and to strike a new deal. However, anti-nuclear activists defeated the treaty in a tribunal, where Palau’s High Court ruled a 75 percent vote favoring a proposed Compact of Free Association was required in order to override the small nation’s anti-nuclear laws. In 1987, terrorists firebombed and shot Pacific pacifists, and besieged Palau’s congress. A U.S. Congressional General Accounting Office investigation found a $2 million U.S.-derived slush fund financed political violence. In 1988, Palau’s second elected president, pro-U.S. puppet Lazarus Salii, also mysteriously had his head blown off. Although this was officially declared a suicide, the elimination of Salii—who was unable to pass the Compact—untied the Gordian knot that led to the elimination of Palau’s nuclear bans. Other high ranking U.S. officials during the Reagan-Bush era with links to Palau include: Secretary of State George Shultz, who secured Palauan beachheads as a Marine sergeant during WWII. 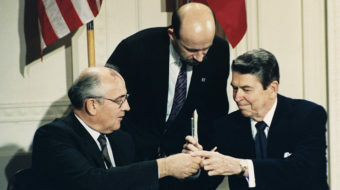 Shultz returned to Palau in 1986 during the Compact re-negotiation process. In the late 1970s, Admiral William Crowe surveyed land in Palau for U.S. bases and became CINCPAC Commander and Joint Chiefs of Staff Chairman 1985-89. Pres. Bush Sr. appointed Brent Scowcroft, who’d arranged the Kissinger-ordered surveillance of Micronesian status negotiations, National Security Adviser. Paris was Washington’s colonial partner in Oceania, and in the 1960s Moruroa atoll, in French-occupied Polynesia, became France’s South Pacific nuclear testing site for atmospheric and underwater N-blasts. 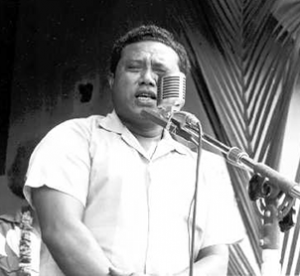 On Jan. 12, 1985, Eloi Machoro, a militant leader of the Kanak indigenous people fighting for independence from France, was killed by French police snipers. On March 2, 1985, shortly after he’d returned from meeting anti-nuke activists in Auckland, New Zealand, Tahitian activist Charlie Ching was arrested walking to a pro-independence, anti-nuclear rally in Papeete, Tahiti. On June 30, 1985, the first president of the world’s first national nuclear-free zone was gunned down in Palau. Ten days later, on July 10, French General Directorate for External Security (DGSE) secret agents bombed the Rainbow Warrior vessel in nuclear-free New Zealand, as Greenpeace prepared to protest France’s nuclear testing near Tahiti. The DGSE saboteurs of the Rainbow Warrior were captured and convicted; the implicated chiefs of France’s military and intelligence services resigned. The above appear to be part of a coordinated counterinsurgency program to defeat the nuclear-free and independent Pacific movement. French state terrorism was indisputably responsible for bombing the Greenpeace ship. Is it farfetched to think the assassination of Palau’s presidents and reign of terror were American state terrorism? Inquiring minds want to know. As former CIA chief, Bush headed what LBJ called “Murder, Inc.” As mobsters say, “The fish stinks from the head down.” The Pentagon had motive: relocating bases from the Philippines (closed after Marcos’s overthrow) to Palau. But the world’s first nuclear-free constitution thwarted this aspiration. To find out who commits a crime, see who benefits from it: The IPSECO debt and political violence finally wore Palauans down and in the 1990s their anti-nuclear framework of rules lost at the polls. Palau was, in effect, annexed by Uncle Sam, as was the rest of Micronesia, which, as Bush knew from his WWII days, had vital strategic value. The story of Palau is a case study full of irony in U.S. imperial rule and Bush governance. During Bush Jr.’s Iraq War, the beaten-into-submission islands joined the so-called “coalition of the willing.” Palau, a U.S. client state, is one of the few General Assembly members to vote with Washington on unpopular UN matters. Bush 43 claimed he invaded Iraq and imposed regime change because of its purported WMDs. On the other hand, regime change happened in anti-nuclear Palau because it refused to allow WMDs (that actually existed) to transit through its territory. The second Bush administration cited Iraqi ties to Al-Qaeda and international terrorism as another (subsequently debunked) rationale for war, but when tiny Palau dared resist Washington’s will, a real reign of terror was unleashed that included the gunshot deaths of its first two elected presidents. Although Bush II purported that spreading democracy was another reason for invading Iraq, Palauans were forced to keep going to the voting booths until the outcome of a vote was finally deemed acceptable to the White House. If the mainstream media spent one percent of the time investigating Bush Sr.’s ties to the covert actions in Palau as they did extolling his virtues during their funeral coverage, the case of who shot Pres. Remeliik might actually get solved. Instead of lifting up and worshipping a golden calf, the press should mobilize at least some resources to look behind the curtain at the real record of George H.W. Bush and investigate what role, if any, he played in whacking the president of nuclear-free Palau and in subsequent events in the remote isles of Micronesia. See also Ed Rampell’s earlier review of this history here. Ed Rampell covered Palau during Bush’s vice presidency for AP, Reuters, Newsweek, Radio New Zealand, Radio Australia, Gannett Press, Pacific Islands Monthly, etc. He initiated and was the investigative reporter for ABC News’ 20/20 segment, “The Puzzle of Palau,” which aired in July 1987 and proved that three young men related to the opposition leader convicted of assassinating President Remeliik were framed political prisoners. Within two weeks of the Barbara Walters-introduced report, they were fully exonerated of the murder by Palau’s Supreme Court. Rampell went on to file for the Australian Broadcasting Corp.’s “Background Briefing” a two-part exposé that directly resulted in the conviction of Palau’s pro-Washington Minister of State for soliciting the homicide of President Remeliik.